INTRODUCTION - Having failed to completely solve the puzzle 'Light Shining out of Darkness' by William Cowper (with additional clues by DIMITRY) which appeared in the July 1984 issue of CROSSWORD, I awaited the solution with interest and the explanations and comments (September issue) filled me with sheer amazement. Consequently, on reaching for The Oxford Dictionary of quotations, I wasn't at all surprised to find that 6 38 (unclued) had concealed more than a dozen words in just four lines of verse. Having put these words into the perimeter and 29 Across of a diagram, I dedicate the puzzle to DIMITRY and offer it for the return match between Super and Average Solvers who are members of THE CROSSWORD CLUB. 14 MISPRINTS (M) clues have one letter misprinted in each definition, the correct forms of the misprinted letters give, in the correct order, the title of the puzzle. ANSWERS TO 7 NORMAL 'PLAYFAIR' (P) clues are to appear in the diagram in code according to a key-word which has to be discovered, the key-word helps to form the sub-title of the puzzle. ANSWERS TO 9 LETTERS LATENT (LL) clues have one letter omitted; definitions refer to the unmutilated answers; subsidiary indications (lengths indicated by numbers in brackets) refer to the mutilated forms entered in the diagram. The omitted letters, when arranged as one word, complete the sub-title. 14 PRINTER'S DEVILRY (PD) clues are passages from which the printer has removed a hidden answer, closing the gap, taking liberties perhaps with punctuation and spacing, but not disturbing the order of the remaining letters. Example; - 'One hears the Bach concert conducted by Bernstein (6)'; Answer: - ESTATE. 'One hears the best at each concert conducted by Bernstein'. Each passage, when complete, makes sense. 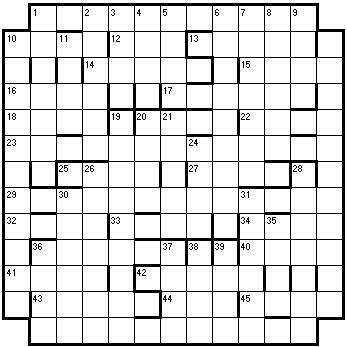 14 DEFINITION ONLY clues (in the correct order) to words in the Perimeter (read clockwise) and 29 Across have one letter misprinted in each; the correct forms of the misprinted letters can also be arranged to form the title of the puzzle. Solvers should send the title, the 14 words in the perimeter and 29ac, and write a cryptic clue to the subtitle (7,9) to derek@crossword.org.uk Entries to arrive before 12 May 2001. Results and solution will be published in the newsletter of the Crossword Centre mailing list. The prize is a copy of Chambers Cryptic Crosswords and how to solve them.